Just weeks after Leeds United manager Marcelo Bielsa infamously sent a member of staff to the training ground of Championship rivals Derby County, La Liga has been rocked by its very own 'spygate' scandal. Sort of. The victims? Spanish champions Barcelona - and more specifically the club's all-time leading goalscorer Lionel Messi. The spy? Amunt, Valencia's daring bat. But it's fair to say this wasn't an undercover mission. Because it's hard to stay under cover when you're a 'teddy bat' proudly wearing a rival team's shirt. And live tweeting your 'mission' certainly doesn't help. 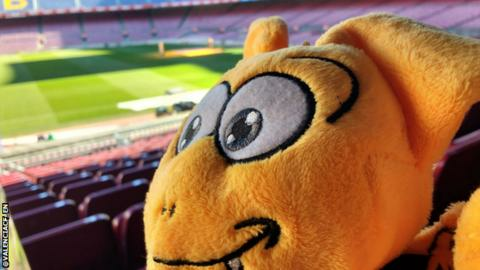 A three-hour train journey later, 'Amunt' had arrived at Barcelona's Sants station. So far, so good. ... but with the club relying on him to deliver before facing the league leaders on Saturday, Amunt simply couldn't return home empty-handed. And an hour in 'hiding' yielded tactical gold - five-time Ballon d'Or winner Messi is... "good". That's why they (may) pay this particular spy the big bucks. Sadly, though, his cover was blown - and Barcelona had the last word. Quiz: How well do you know football's brothers?